What is the 4:6 Conference? * The 4:6 Conference is a weekend event that focuses on the three elements of "seeking God," outlined in Philippians 4:6. Prayer. Petitions. Praise. * Three services, ideally offered on Friday night, Saturday night, and Sunday morning. Night one, we will discuss elements of prayer and what it means to "know God," followed by a corporate prayer meeting. Night two, we will put our faith in action by "making our requests known to God," through unified pleas and intercession. Day three, we will offer up our praise and thanksgiving to God for what He's done, will do, and has already done by way of praise and worship and real testimonies. *Worship music can be provided by Jon Parrish Evangelistic Association upon request. *This conference is for any of God's children who are desperate for a fresh move of God, a new (fresh) anointing, and revival. It is for the people of God that share one common goal - Christ - and a burden for genuine awakening. 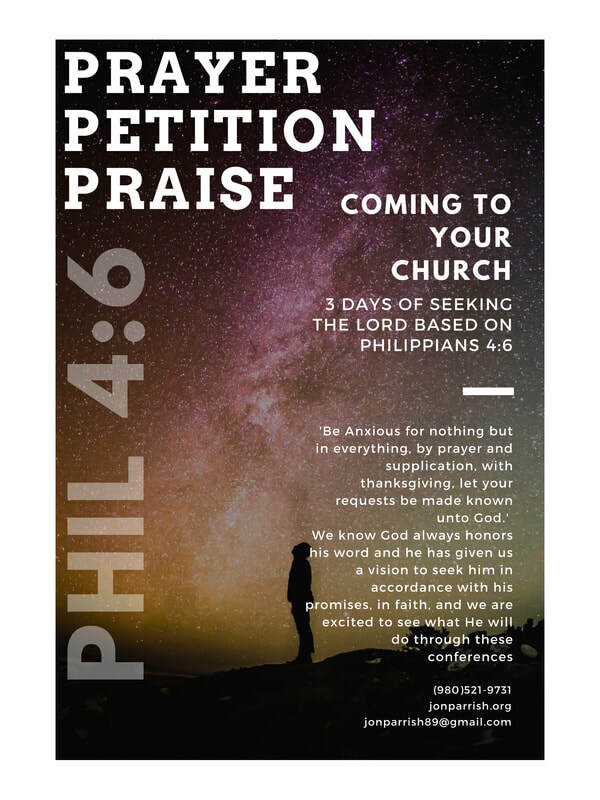 *Prayer, petitioning and praise are necessary to living a care free life that leans entirely on Christ, and the will of God (Philippians 4:6-7). These elements of worship are necessary to right thinking (Philippians 4:8), and putting them in PRACTICE will result in assurance that God is with us (Philippians 4:9). When the body of Christ corporately engages in these three areas of worship, God cannot help but manifest Himself and make His presence known! *First, call or email Jon Parrish Evangelistic Association to book a meeting. Then, if you're serious about this, begin preparing your Church to realize God's presence. This can be accomplished through corporate prayer, fasting, and claiming the promises of God that are outlined in His Word.